Transit Employee Impersonator Busted Yet Again! If you are any sort of tri-state area transit buff or just keep up on news, you know who Darius McCollum is. For those who do not know him, he is the infamous individual who has been arrested many times for impersonating transit officials. Some of his antics have included impersonating a motorman in 1981 at the age of 15. During this encounter, he drove a downtown E filled with unknowing passengers from 34th Street-Penn Station to the World Trade Center. 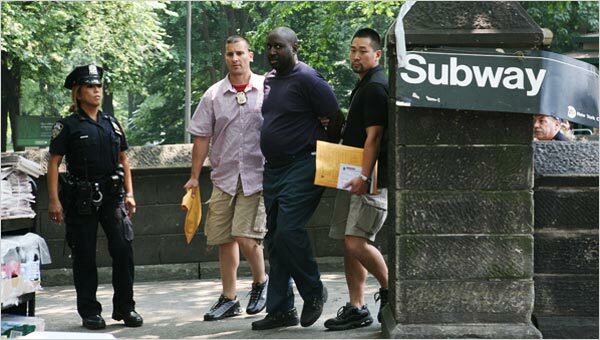 He was busted back in June for entering a restricted area of the 59th Street-Columbus Circle Station. A train buff with a long track record – that includes taking a subway train for a joyride – has been arrested for impersonating a federal agent, police said Monday. Darius McCollum, 43, flashed a bogus badge and a forged ID card to a Long Island Rail Road conductor after boarding a train in Penn Station on Sunday night, Metropolitan Transportation Authority police said. Prior to Sunday, McCollum had been arrested 25 times for pretending to be a transit worker. “I’m not surprised,” McCollum’s weary-sounding mother, Elizabeth, said of the latest arrest after being reached Monday in North Carolina. McCollum in recent years has been living in North Carolina, but he ignored his mother’s warnings and took a bus back to the city Sunday, she said. “He’s a lover of New York and can’t get over it,” she said. McCollum’s first run-in with the law came in 1981, when he assumed the role – and duties – of a subway motorman. Like I said back in June, jail is not the answer for Darius. While I am not condoning his actions, it is clear he has some medical issues which can’t be solved behind bars. It is a shame that he could not be considered for a position with the MTA has he clearly has shown no intention to do anything damaging. He obviously has a passion which has led to making incorrect decisions but not in the way of purposely trying to hurt someone. I don’t know what can be done for him as he seems to have very little options left. Such a shame……..
Wow, that’s wild. Yeah, he definitely seems harmless, if anything sounds like he really truly knows what he’s doing. In addition getting id’s and things together to do those impersonations isn’t the easiest thing to do, not the hardest, but not the easiest either. Strange, I wonder what they will do with him. He’ll probably just keep doing this his whole life if it entertains him.